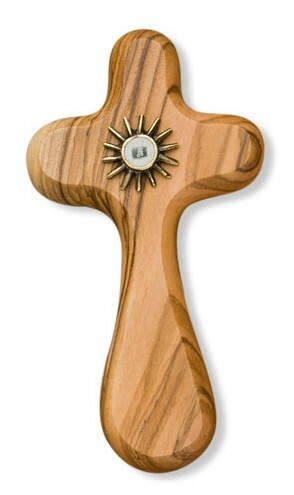 Made of OLIVEWOOD from Bethlehem, this beautiful Comfort Cross has smooth edges and rounded corners, making it easy to hold in times of illness or trial. In the centre is a small bronze-finished case that contains a piece of cloth that was touched to Jesus' tomb at the Holy Sepulchre in Jerusalem. The cross measures approximately 3 3/4" and is perfect for the ill, bereaved, or daily prayers and meditations. Makes the perfect gift from the Holy Land for Christmas, encouragement, or any occasion.